SAM helped our wedding clients create a unique Surrey wedding. 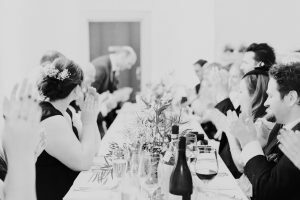 As preferred supplier at local venue Leith Hill Place a haven of shabby chic granduer, we developed a sound, lighting and artist entertainment package to compliment the Herb Kitchen’s delicious catering and the clients personal input. 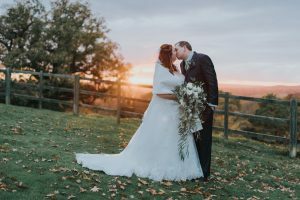 Months of planning came to fruition when guests were met by a fireball sunset streaming across the South Downs and bathing the venue in a warm glow. The perfect backdrop for the wedding photo’s. 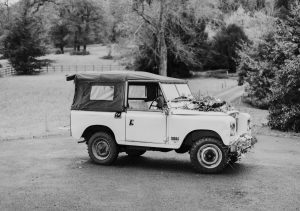 Drinks were served in the drawing room which opens out onto the verandah with breathtaking views across the Weald sweeping down from the lawn. 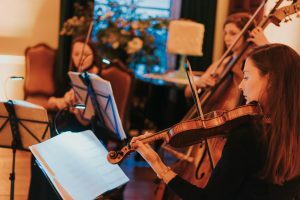 Our female string trio Blue Topaz helped the champagne flow with their mix of contemporary classical melodies swept the room. Upstairs for a sit down supper for sixty, speeches, drinks, slow cooked shin of beef, salt baked celeriac and more speeches. Finally back downstairs for the cake cutting coffee and nightcaps as another of our artists Scott Baylis played current stylish classics and current hits on the grand piano in this the previous home of composer Vaughan Williams. A very special Surrey wedding, for more information on the venue or any of the artists please get in touch.